An Italian book reviewer invents a new genre: epistolary literary criticism for children. Cotroneo is the author of two untranslated novels and the cultural editor for a leading Italian weekly, L’Espresso. He is also the father of a young son, Francesco, who, to judge from the hints dropped, must be about four. 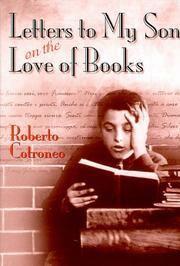 Cotroneo has had the wonderful idea of explaining to his son, in a series of letters, the pleasure of reading books. Why hasn’t this been done before? And as long as we are pondering counterfactuals, why hasn’t it been done better? Apart from the fact that Cotroneo’s prose, or perhaps that of his translator, is often wooden and lifeless, and apart from the embarrassing sentimentality of his many apostrophes to Francesco, he makes some mighty strange decisions about what his child ought to read. We must assume the boy is supposed to read his dad’s book about 12 years down the line. The works he chooses for Francesco are: Robert Louis Stevenson’s Treasure Island, J.D. Salinger’s Catcher in the Rye, T.S. Eliot’s “Love Song of J. Alfred Prufrock,” and Thomas Bernhard’s macabre novel The Loser. However odd these choices may be, Cotroneo gradually wins over the indulgent reader. His commentaries are interesting and often (but not always) shrewdly judged. But who is this book for? It’s hard to imagine little Francesco or anybody under the age of 18 tackling Bernhard’s extraordinary book. So much the better that Cotroneo calls our attention to a neglected master—and recalls our attention to Treasure Island, which here is probably not so widely attended to as the movie A Muppet Treasure Island. An endearingly and unclassifiably odd book that will probably be misfiled in the “Parenting” section of the bookstore shelf and overlooked by the general reader—unless its sheer weirdness makes it a cult favorite.